“So you are looking forward to enlarging the space of your inner garden.” That’s cool. If your requirement also involves in having easy installation along with a beneficiary compact unit, then choosing VIVOSUN is the best one for you. This VIVOSUN grow tent review aims at adding more value with an exceptional description about it. So many unique and valuable features are available in it. Here, you will learn about the essential aspects along with well-researched review provided by customers about this grow tent. We are not here to mislead you by any chance. Hope, you will find it non-biased while you try to match with it genuinely. Let’s proceed on this article. Before we are going to resume our discussion, it’s better to let you know about the foundation and whereabouts of this company I think. In our views, it might be a great way to have precise ideas about the products after knowing about the company at first. VIVOSUN is a popular manufacturer company founded in China. They have been leading the market for more than 8 years with much-appreciated values provided by their customers and clients in indoor grow tent products. Besides, grow tent, they offer notable performance in LED grows lights too. With the exceptional and improved quality of their manufacturing products, they highly acquire the values from every respected customer. This reputed brand also promotes its manufactures with other essential grow tent accessories like carbon filters or fans maintaining quality values to the extent possible. VIVOSUN Hydroponic grow tent is an unrivaled choice of every professional indoor grower. With an extended dimension of 4’×4’, it allows the easy growing of plants in a large approach. This solidly built product offers exceptional light efficiency too along with so many supportive features. Instruction booklet will let you do the easy setup. In this Review, some must know top-notch features are important to know. Here they are. If you fail to concentrate on regular monitoring of the plants, this is quite difficult enough to grow plants with equal healthy growth. 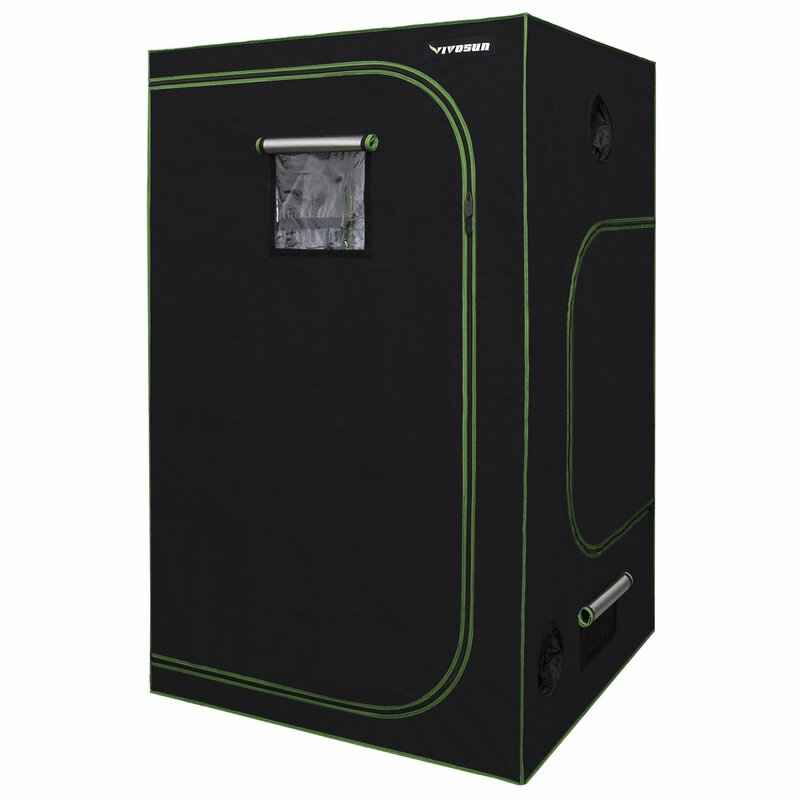 VIVOSUN 48”×48”×80” Grow Tent features a high-grade reflective monitor. 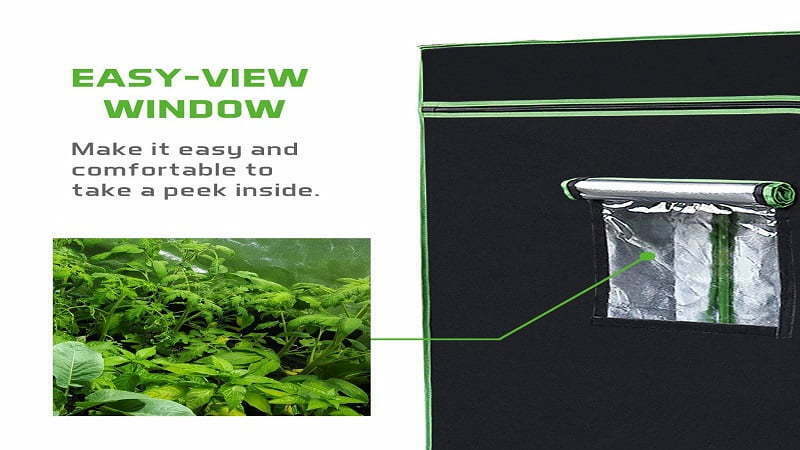 This transparent easy viewing promotes you to optimize the fullest observation of the growing plants. It makes you free from taking hassles of frequent physical entry inside the tent. VIVOSUN offers convenient storage that preserves other essential equipment of the tent securely. Again tool handing bag is available in it for keeping other essential small sized components. It features with a removable floor tray that is another supportive amenity as well. This dirt-proof tool allows for the additional advantage of cleaning the spills easily. 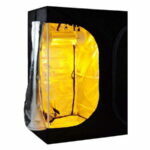 This reputed grow tent steps ahead offers metal frames with unrivaled tool free connectors as well. In fact, it makes the VIVOSUN more lucrative rather than other grow tent brands. The frame quality is reliable and supportive to use for long-term usage. VIVOSUN 48”×48”×80” Grow Tent is highly reflective of the indoor plants. It provides approximately 98% equal light distribution to the plants and helps them grow manually. Again, it helps in saving light by not allowing light escape with the high reflective Mylar. There is another top-notch feature that is 600D tear-proof canvas. As the manufacturers of the VIVOSUN use double stitched quality in it, it relevantly blocks the light and saves enough energy. What if every essential part of grows tent you get but never know how to set up it. VIVOSUN is caring for its customer in this case also. If you are a beginner then you need not to worry about it. Quality instruction booklet makes you achieve the support process and easy installation of the grow tent. Any tool is not required to do so. Remember that you should not make hurry at the very first time to set it up. SBS is one of the greatest zipper’s companies across the world. This VIVOSUN grow tent zipper is manufactured by SBS zippers. Nevertheless, it promotes comfortable gripping and allows comfortable usage to the customers use. High-quality canvas materials are used in it. Secures the whole unit with flexible but solid zippers. The reflective lighting system is effective for the growth of plants. Easy monitoring window is there for keeping more caring concern on plants. There are two years of warranty with satisfactory customer support with it. No major issues are found but a few customers made issues for a bit of light leakage problem. VIVOSUN hydroponic grow tents are easy and flexible to use. Despite the presence of electrical equipment such as hanging light, ducts etc. inside the tent, it offers you the assurance of safety. Strong 600D canvas makes this grow tent fairly contributes to preventing light leakage. Reliable metal frame it offers you with suitable stitching and quality. VIVOSUN offers aftersales support with 2 years of warranty that is pretty good for any customer’s usage. There are ventilation port and exhaust ducts for keeping sound environment enrolled inside the grow tent. Otherwise, it could fail to manage temperature and climate control issues. It provides an easy assembly to get instruction for easy set-up of the tent. It makes things easier and comfortable for any growers. Hopefully this VIVOSUN grow tent review can direct you to the right choice for using any grow tent. We have always prioritized the quality, construction and the service efficiency a product can offer to the customers. VIVOSUN comes with all positive ratings and reviews you can check. Only the user’s convenience is their main objectives to be acquired. So choosing it would be worth of your investment for sure.